where α1, α2, …, αn are the roots of the equation f(x) = 0 and β1, β2, …, βs are the roots of the equation g(x) = 0. The resultant vanishes if, and only if, the two equations have a common root or their leading coefficients are both equal to zero. Let there be given the two equations P(x,y) = 0 and Q(x,y) = 0, where P and Q are polynomials in x and y. Suppose these polynomials are arranged according to powers of x, and the resultant of the polynomials obtained is equated to zero. An equation in y is then obtained of degree at most sn. Here, η is the degree of P in x and y, and s is the degree of Q. If x = x0, y = y0 is a solution of the given system of equations, then y = y0 is a root of the equation R(f, g) = 0. The process of solving a system of two equations is thereby reduced to the solution of a single equation. The resultant of a polynomial equation and its derivative is equal, except possibly in sign, to the discriminant of the polynomial equation. If the discriminant is equal to zero, the polynomial equation has multiple roots. The resultant of a system of forces is a force equivalent to the given system and equal to the vector sum of the forces: R = ΣFk. 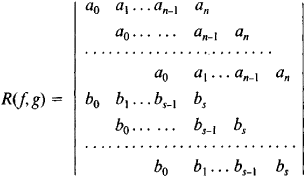 A system of forces applied at the same point always has a resultant if R ≠ 0. Any other system of forces applied to a body has a resultant, if R ≠ 0, when the moment of the system either is equal to zero or is perpendicular to R. In this case, the system of forces may be replaced by the resultant of the forces only when the body may be regarded as perfectly rigid. The system may not be replaced when, for example, internal forces are to be determined or when other problems that require the deformation of the body to be taken into account are to be solved. A couple and a system of two forces that are not coplanar are examples of systems of forces that do not have resultants. For a set of polynomial equations, a function of the coefficients which equals zero if the equations have at least one solution. Also known as eliminant. 11 August 2016 - California-based consulting firm Sensiba San Filippo LLP has acquired California-based boutique sized consulting firm The Resultants, Inc.
An alternative method uses material models formulated directly in terms of shell stress resultants (i. Prospective Resultants undergo a rigorous selection process, followed by intensive training on Thomas Group's proprietary process improvement methodology, Process Value Management. Our Resultants represent the front line of our program deployment, and we are fortunate to be able to recruit only the most experienced and senior business people. Resultant Suresh Kamath has more than 30 years experience in strategic planning, growing start-up businesses, and creating process-driven organizations.